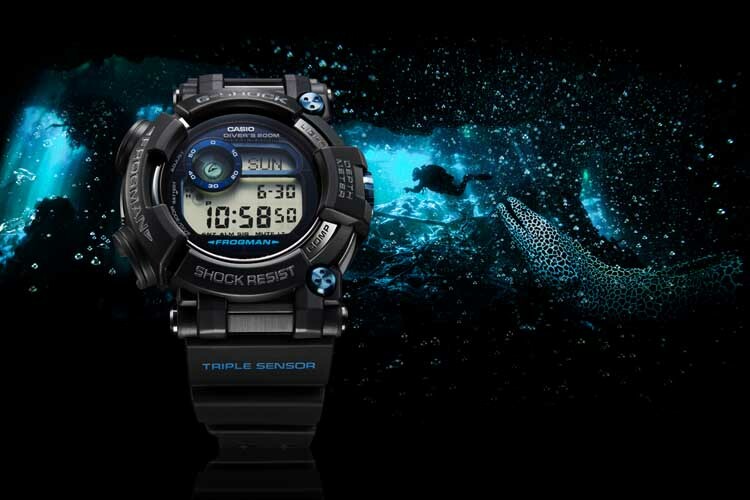 G-Shock Frogman is Casio’s vision of the ultimate dive watch. Every single little detail about the Frogman indicates it made for professional divers. In other words, a proper diving watch. Frogman has a rich history. The first model (DW-6300) was released in 1993. 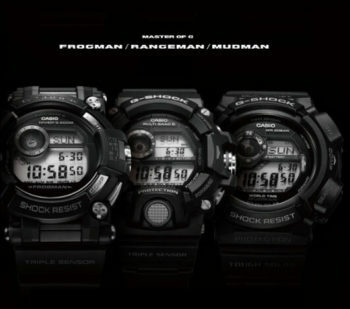 It was one of the G-Shocks to be included in Casio’s premium “Master Of G” line (along with Rangeman, Mudman, etc.). All “Frogmen” are made in Japan and have the iconic “diver frog” on the screw down caseback of the watch. Side note: Earlier generations of “Frogmen” had their casings made from titanium, but Casio has since switched to stainless steel. The reviews on Frogman are outstanding. People rave about quality, display, heft, and feel of the watch. The big asymmetrical design makes it one of the meanest, toughest-looking watches that you can find. 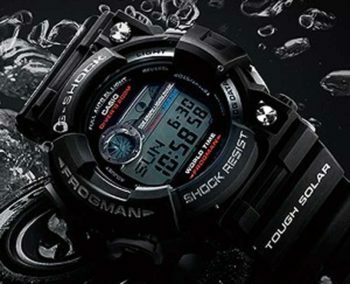 Because of the bold design, G-Shock Frogman is one of those watches that you’ll either love or hate. The design is unique, but not everyone’s cup of tea. What sets the Frogman apart from other G-Shocks is its compliance with the ISO 6425 Diving Standard and the dive-specific features that we’re going to take a closer look at below. When I first got my hands on the Frogman, it was an obvious step up in terms of quality from the rest of the G-Shock lineup. The solid feel of the case, the smoothness of the buttons, and the thick, durable strap are all immediately noticeable – in a great way. 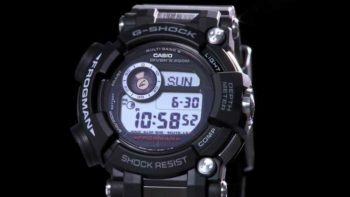 Frogman is built like a tank and feels like double the quality of Casio’s cheaper and mid-line G-Shocks (GD350 or DW9052, for example). Stainless steel buttons are big and easy to operate even with gloves on. 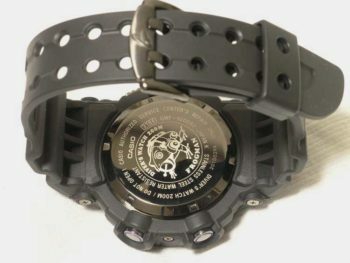 As with most G-Shocks, Frogman has “bumpers” in the middle of the watch. They help you find and hit the right buttons, and after some practice, you’ll be able to operate the watch without looking. Must-have for a diver, as you’ll have bubbles etc. underwater that will make it difficult to spot the right buttons on the watch. The buttons on the right are large, grooved and easy to press. On the left, the buttons are circular, DLC-coated and deep inside the shrouds. From what it seems, the start/stop and light buttons on the right are indented to be used underwater, but the mode/set buttons on the left are not. Frogman is one of the few G-Shocks that comes with a full stainless steel inner container for the time module, as well as a screwed-in caseback. Both the casing and caseback are coated with DLC (diamond-like carbon) for saltwater and rust protection. The strap is made out of two layers of fused neoprene over a strip of carbon fiber. It’s attached to the watch case with four quarter-inch Allen screws. It’s one of the toughest straps that I’ve ever seen. 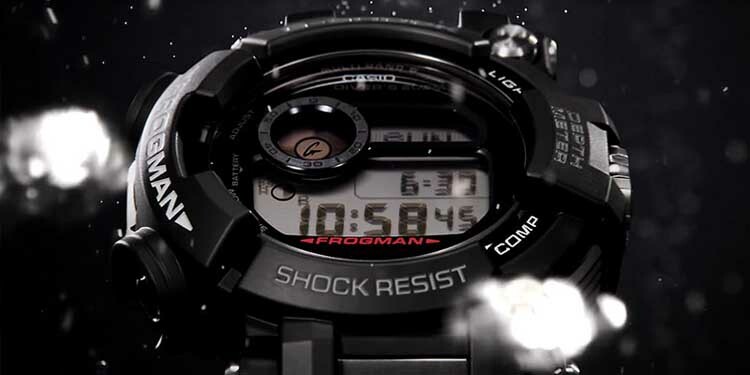 Frogman comes with a scratchproof sapphire crystal display and is (obviously) shockproof and 200m waterproof. Side note: Synthetic sapphire crystals are common only on high-end watches. Cheaper watches come with either plastic/acrylic or mineral crystals that will get scratched over time. Below is a short review of all the features that the watch comes with, including how/where you might find them useful. Tough Solar quartz movement – The solar battery inside Frogman can survive for 10 months without exposure to light. You can expect 10-15 years of use out of the battery, if not more (even solar batteries will lose their recharging capacity over time). Atomic Time – Frogman calibrates its time via radio signal once per day. This means that the time display will be perfectly accurate 100% of the time, as long as the watch is in the range of the radio signal. Casio’s Multi-Band 6 radio signal calibration is available in Japan, North America, UK, Europe, and China. Moonphase and tide indicators – The 7-segment tide graph and moonphase are useful for shore diving, fishing, or surfing. Insert your location coordinates into the watch and it will calculate the rest. You can program in your UTC offset and lunitidal interval, too. The triple sensor turns Frogman into a real “mini computer”, but it also adds quite a bit to the price of the watch. Side note: On any other G-Shock, to use the inbuilt compass you’d have to hold the watch horizontally. 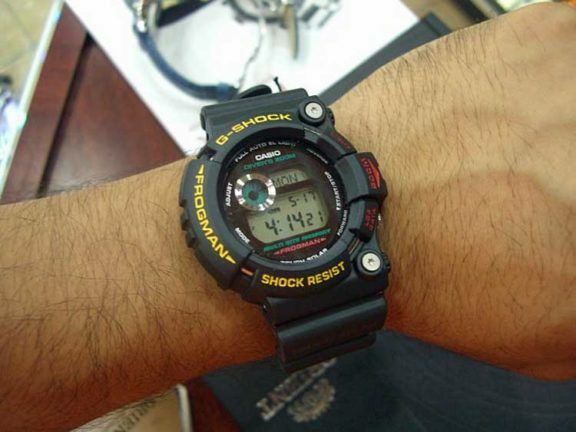 Since that’s not always possible underwater, Casio outfitted the Frogman with an “automatic horizontal compensation system”. With this system, you can use the compass with a tilt of up to 80 degrees. There is a hands-free backlight activation mode – when turned on, you can activate the backlight by flicking the watch from horizontal into vertical position. Or by pressing the backlight button the old-school way. G-Shock Frogman is not a dive computer. In theory, you could use it with some dive tables to calculate your decompression stops. 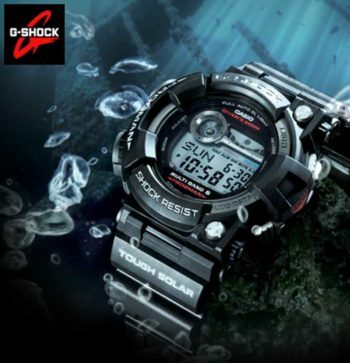 But even Casio themselves recommend that you don’t rely on Frogman 100% while diving. Instead, Frogman is a professional-grade backup for a dive computer. In fact, most diving instructors that I’ve seen have had a regular G-Shock strapped right next to their dive computer. Side note: An important function of the dive computer is the automatic calculation decompression stops. It also monitors the air in your tank, which is something that no diver watch will do. While I haven’t been out diving with my Frogman, according to the reports the watch performs great underwater and is very intuitive to use. You enter the diving mode by holding the bottom left button for two seconds. This activates your dive timer. The dive timer shows your dive start time and local time in addition to the time that you’ve been underwater. After the dive, you stop the timer by pressing the right bottom button. Then you save the dive data with the upper left button. Frogman also shows the “surface interval”, which is how much time has passed since your last dive. You can save the data for up to 20 dives. There is an ascent rate alarm that goes off automatically if you break the diver’s rule of thumb – never ascending faster than 10 meters per minute to avoid decompression sickness. The alarm is an essential safety feature of the watch and can’t be disabled. If you get the advanced, triple-sensor Frogman (GWF-D1000), you can also measure your depth and the water’s temperature. Finally, it’s time to talk about the elephant in the room – the SIZE. G-Shock Frogman is a huge watch at 59.2 mm in diameter and 18.0 mm in thickness. The large size of the watch makes it easy for divers to wear it on top of their scuba gear. Because of its solid stainless steel DLC-coated case, Frogman is also heavy. At 4.97 oz. in weight, you can feel that the watch means business. But is it wearable without the scuba gear? Not surprisingly, that is the biggest question most people have about it. Even I had my doubts about whether the Frogman would be comfortable on my wrist for extended periods of time. Well, the answer is YES. After getting used to it, it’s a pleasure to have the Frogman on my wrist, and it never becomes uncomfortable or intrusive in any way. For its nearly 60mm diameter, the watch is surprisingly wearable. Despite its weight and large lug length, it sits very flat on my wrist and doesn’t feel as top-heavy as many other dive watches. I never felt like it was going to swing off center or anything. The Master of G showdown. Frogman is the G-shock dive watch. In water, it has no competition. It also has a better build quality than Rangeman and Mudman, especially with its DLC-coated stainless steel parts. The greatest weakness of Frogman is its price. It’s more expensive than Mudman and Rangeman, and you’ll have to pay extra if you want the triple sensor version. Rangeman gives you the “best bang for the buck”. In addition to the triple sensor, it has all the premium G-Shock features that you might want from it (it’s #1 in our military G-Shock list). Mudman is the cheapest of the three. It has a compass but comes without barometer and altimeter that the Rangeman has. It’s the most “basic” of the three, but a very good deal for a compass watch. G-Shock Frogman is a superb diving watch that wears very comfortable despite its large size. If you’re a serious diver, this watch is easy to recommend. 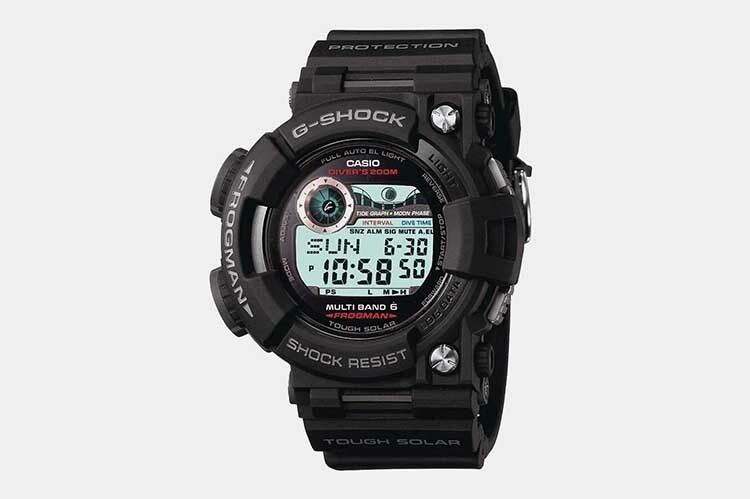 You’ll likely use the majority of the functions in the Casio G-Shock Frogman on a regular basis. If you are a tech watch collector, you’ll love the looks, quality, and overall functionally of the Frogman. You’ll appreciate what it can do and how it is built compared to most other G-Shock watches.